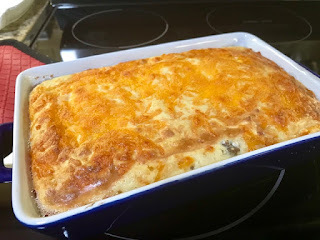 My good foodie friend, What's for Dinner, Mom posted a recipe for Baked Chicken Ranch on her blog and I decided I'd use her recipe but I would substitute Greek yogurt for the butter and use bone in chicken and see what results I would get. My chicken breasts were very large so if you use bone in chicken breasts allow for extra cooking time. I enlarged the picture to show how the Greek yogurt held in the moistness. Here is Tina's recipe: I'll highlight, in red, my changes. Preheat oven to 375. Mix together all dry ingredients. Melt butter. Dip each piece of chicken in butter and then dip in Panko crumbs, coating well. ***Note: This is where I changed the recipe. I rubbed the Greek yogurt that I had mixed with garlic and parsley, all over the chicken, to coat it and then dipped the chicken in the dry ranch/Panko mix bread crumbs. Place in a(foiled and sprayed baking dish (Pam). Bake until golden brown about 25 minutes. Also some yummy sides to add to this meal! **** Note: I used split chicken breasts and they were very large so my adjusted time was quite a bit more. Almost 1 hour baking time. I covered the chicken with foil for 1/2 hour and then took off the foil and cooked for another 1/2 hour to brown and the juices were clear. Final Note: I recommend the Greek yogurt for a lower in fat recipe. It was moist and delicious. I suggest you use the boneless chicken breasts for a quicker and easier cooking time.